Gardening is something we tend to enjoy more as we grow older. Unfortunately, as we grow older, our body generally ceases to be as flexible as it used to be. Having to sit down bent over continually as you maintain your garden can start to hurt your back. 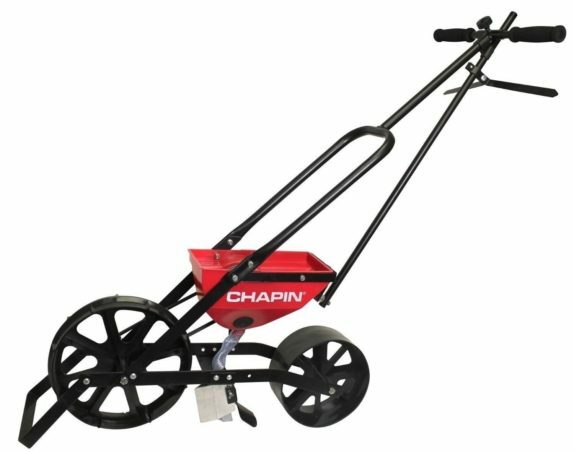 The solution to that is to get a garden seed planter, a device that allows you to maintain your garden without hurting your back in the process. You can buy them or build one yourself! 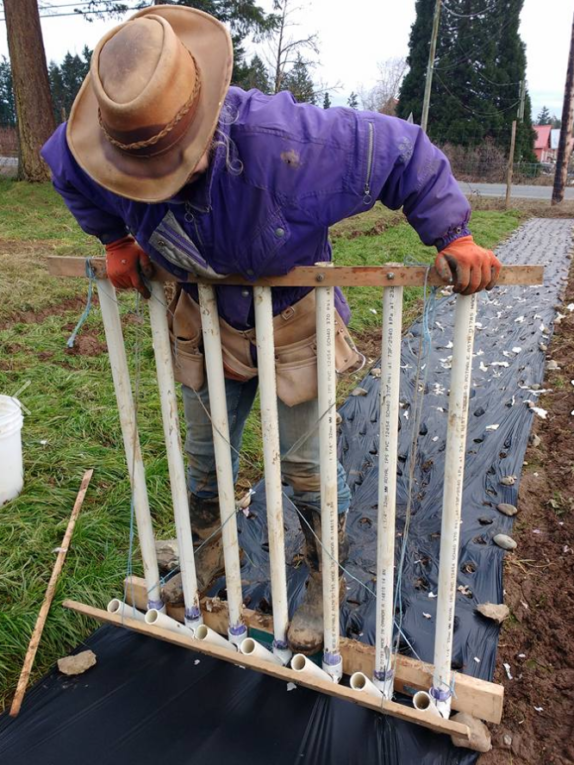 Here you see a very nice design in action, being used to plant garlic seeds. 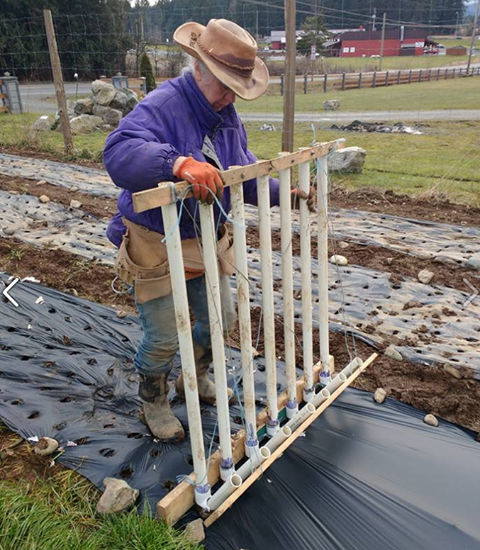 The PVC pipes are used to dig a hole through the plastic in the ground, then seeds are placed in through the top of the pipes. A rope is then pulled to pull up the bottom PVC parts. This releases the seeds into the hole dug in the ground. You can make a design like this yourself, using some wood, PVC pipes, wires, bolts and screws. Take a look at this up close image of the bottom of the design. You can see the attached part of PVC pipe is cut at a sharp angle, to ensure it can be used effectively to dig a hole in the ground. You can also see the screws and bolts, used to allow the design to lift up when the wire attached to the wooden block is pulled up. 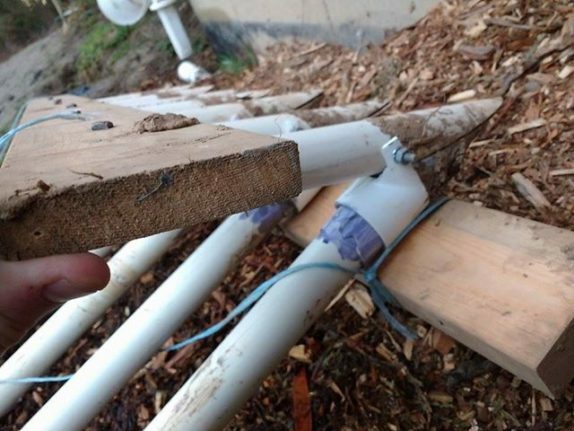 Here you can see the wires attached to the top plank. It shouldn’t be too hard to make a design like this yourself, but how you wish to set it up will depend on the type of garden you have. 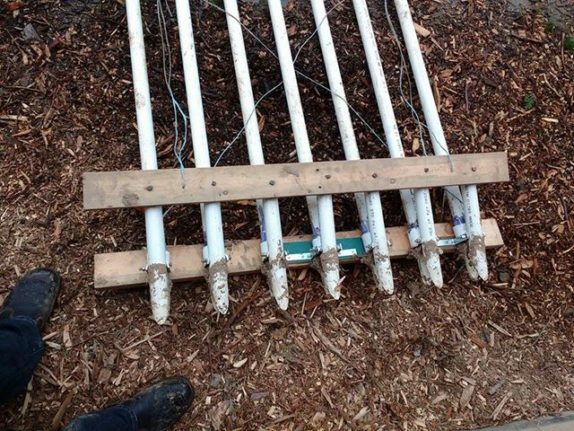 A design with seven PVC pipes might be too large for most people. Like our DIY design above, this machine allows you to plow, plant, cover seeds and mark the next row, all without having to sit down or bend over. It’s definitely worth considering getting one. Of course, you could also make a similar design to ours, using PVC pipes.